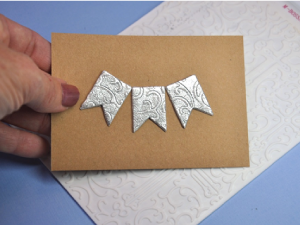 This tutorial shows how to "Wear Your Adhesive on the Outside" by heat embossing powder and afterwards embossing the 3D Foam. 1) Trim 3D Foam Pennants from sheet of pennants. Here we are using 3D Foam Pennants, but you can use any of our 3D Foam adhesives. 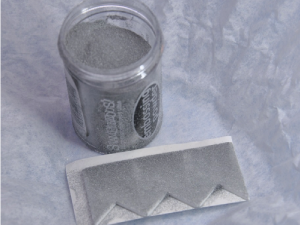 2) Remove top liner from each 3D Foam Pennant, sprinkle with embossing powder until entire adhesive surface is covered. Tap off excess. 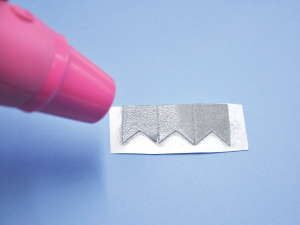 Tip: use a coffee filter to catch embossing powder, and easily return excess back to the bottle. 3) Heat embossing powder with heat tool. 4. Allow 3D Foam Pennants to cool. 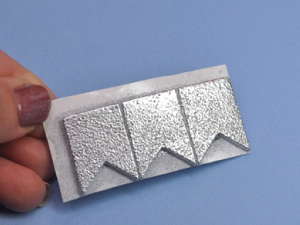 Place 3D Foam Pennants into embossing folder, embossed surface facing the desired pattern in the folder. 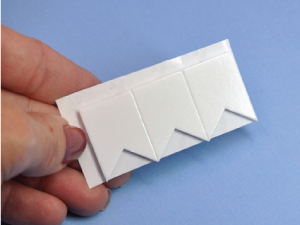 6) Remove double embossed 3D Foam Pennants from embossing folder to reveal the pattern in the embossed surface.